When hearing words “disability” and “accessibility”, the first thing that comes up in many people’s minds is a wheelchair or someone sitting in one. 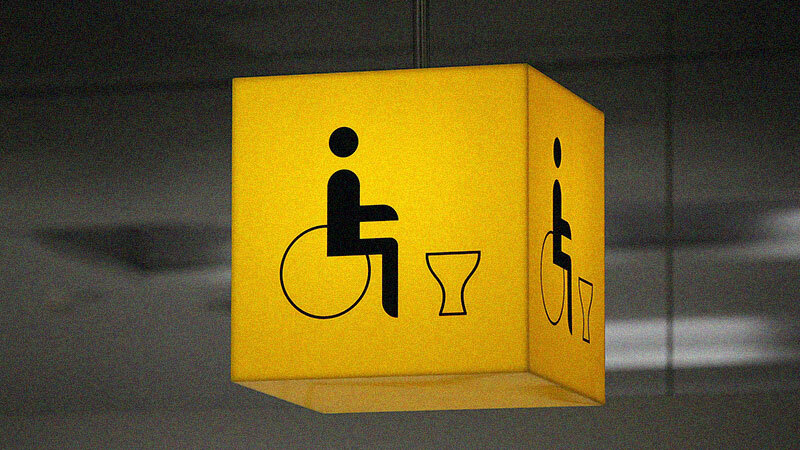 Many accessibility resources use a wheelchair icon as a symbol to represent accessibility. The problem is that not all and even not most people with disabilities are wheelchair users. Most people who have hearing, visual, learning disabilities don’t use wheelchairs – unless they also have physical disabilities. Even not all people with physical disabilities use wheelchairs – for example, people with missing arms or leg amputees walking with leg protheses. Many people with disabilities – myself included – don’t feel that the wheelchair symbol represents them. Using the wheelchair symbol for accessibility also causes problems for many people with disabilities because it further spreads wrong assumptions that anyone who doesn’t use a wheelchair is not disabled. Many disabilities are not visible. You cannot tell, for example, that a person is deaf unless they use hearing devices or communicate in sign language. Just because they don’t use wheelchairs, it doesn’t mean that they don’t have any accessibility problems. People with sensory disabilities have accessibility needs that are different from those of wheelchair users, so ramps and elevators are not right types of accommodations for them. Many also think that elevators and wheelchair ramps are enough to comply with ADA mandates for buildings and public spaces – without realizing, for example, about fire strobes or communication access needs for deaf people at public events. If you host an event, you may think that you have already satisfied ADA requirements by finding a wheelchair-friendly space. But it’s not enough – you would also need to think about deaf attendees, for example, who rely on live captioning and/or sign language interpreters to be able to follow and participate in events. Wheelchair icon also causes problems to many deaf people during their travels. The most common problem they experience at airports is that they often are greeted by assistants with wheelchairs after their plane lands. While most of aural announcements and entertainment is not captioned – which is the actual accessibility need of deaf travelers. Same goes to staying at a hotel room. Sometimes deaf guests are placed in wheelchair accessible rooms instead of regular rooms with Deaf kits – even after deaf guests specifically ask for a Deaf kit. This had happened to me on several occasions. Using the wheelchair symbol for web accessibility makes it even more confusing. Most people with disabilities experiencing web accessibility issues are individuals with visual, hearing, learning, and upper mobility disabilities. It doesn’t even make sense to use a wheelchair icon as a web accessibility symbol – you don’t need a wheelchair to be able to surf the Internet. As a deaf web user, I rely on captions to be able to understand videos and podcasts and to follow and participate in webinars. The wheelchair symbol may make sense in certain situations – for example, to indicate an accessible restroom or certain spaces that allow for wheelchair users to be able to get around without barriers. However, it is NOT an UNIVERSAL symbol for accessibility and does NOT represent people with ALL disabilities. So what’s the best symbol to represent accessibility and all people with various disabilities? I personally think that Apple Universal Access icon is the best answer. It doesn’t focus on certain disabilities or tools that people with disabilities use (like a wheelchair, for example, or hearing aids or eyeglasses). It’s more abstract with arms outstretched to embrace and include everyone regardless of abilities. If you want to better understand about accessibility and various needs of people with disabilities, contact me for consulting services, speaking engagements, or check out my book.